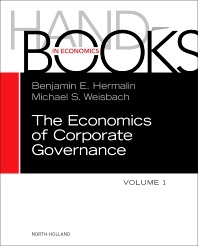 The Handbook of the Economics of Corporate Governance, Volume One, covers all issues important to economists. It is organized around fundamental principles, whereas multidisciplinary books on corporate governance often concentrate on specific topics. Specific topics include Relevant Theory and Methods, Organizational Economic Models as They Pertain to Governance, Managerial Career Concerns, Assessment & Monitoring, and Signal Jamming, The Institutions and Practice of Governance, The Law and Economics of Governance, Takeovers, Buyouts, and the Market for Control, Executive Compensation, Dominant Shareholders, and more. Providing excellent overviews and summaries of extant research, this book presents advanced students in graduate programs with details and perspectives that other books overlook. Benjamin E. Hermalin holds professorships in both the Economics Department and in Berkeley's Haas School of Business. In the latter, he is the Thomas & Alison Schneider Distinguished Professor of Finance. He received the Schwabacher Award for outstanding teaching and research in 1993, and the Earl F. Cheit Outstanding Teaching Award in 1991. His areas of research include corporate governance, the study of organizations, and law & economics. Michael S. Weisbach is the Ralph W. Kurtz Chair in Finance, as well as a Research Associate of the National Bureau of Economic Research. Dr. Weisbach has broad-ranging research and teaching interests in finance and economics, with specialties in corporate finance, corporate governance, and private equity. He has 50 publications on these and related topics. According to Google Scholar, his work has been cited over 30,000 times.